In current design, the rose-in-the-fist logo is solidly coloured instead of drawn in outline, and the name abbreviations in three/four languages (in Italian and Romansch, the same one is used) are no longer preceded by an acute accent each, but are separated with vertical lines. The flag shape is no longer 1:1, but is not very oblong either - being 4:5 or very close. The color scheme (black charges on red field) has remained unchanged. 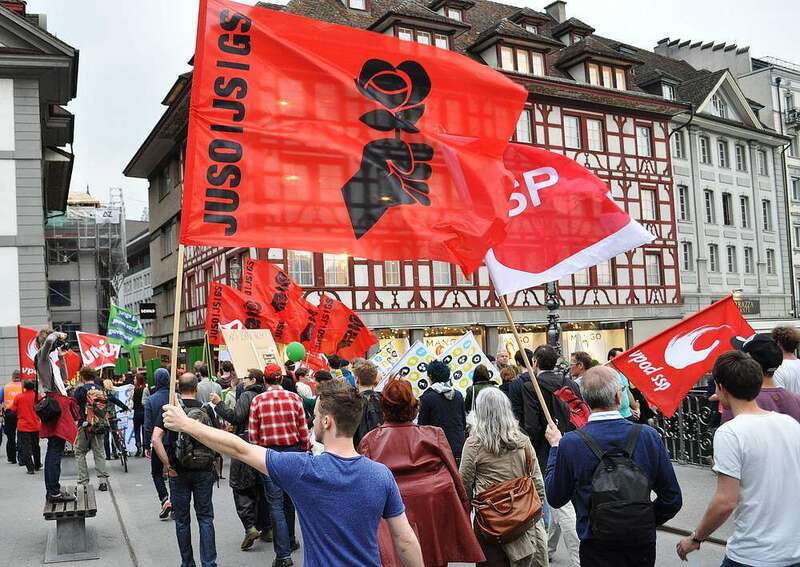 Existing copies of the previous flag are still being used, although the current design prevails. 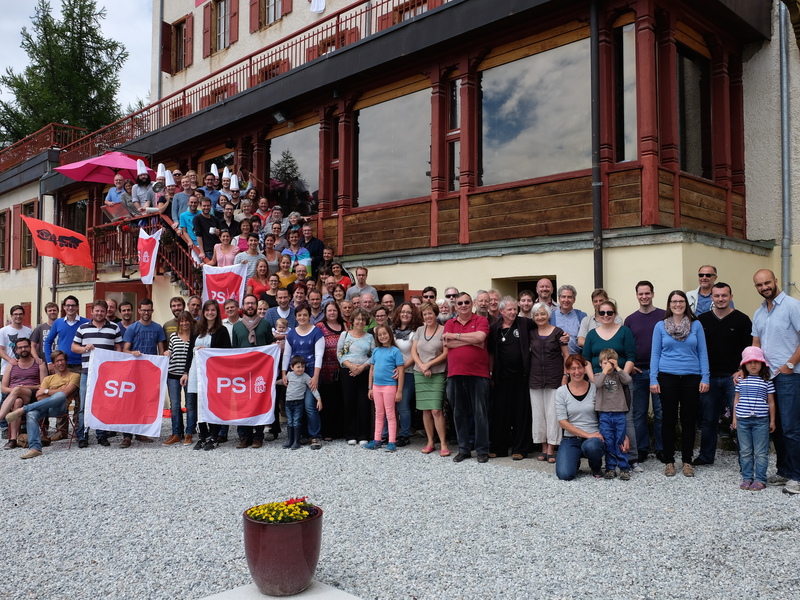 This is the youth organization of the Socialist Party (SP/PS). 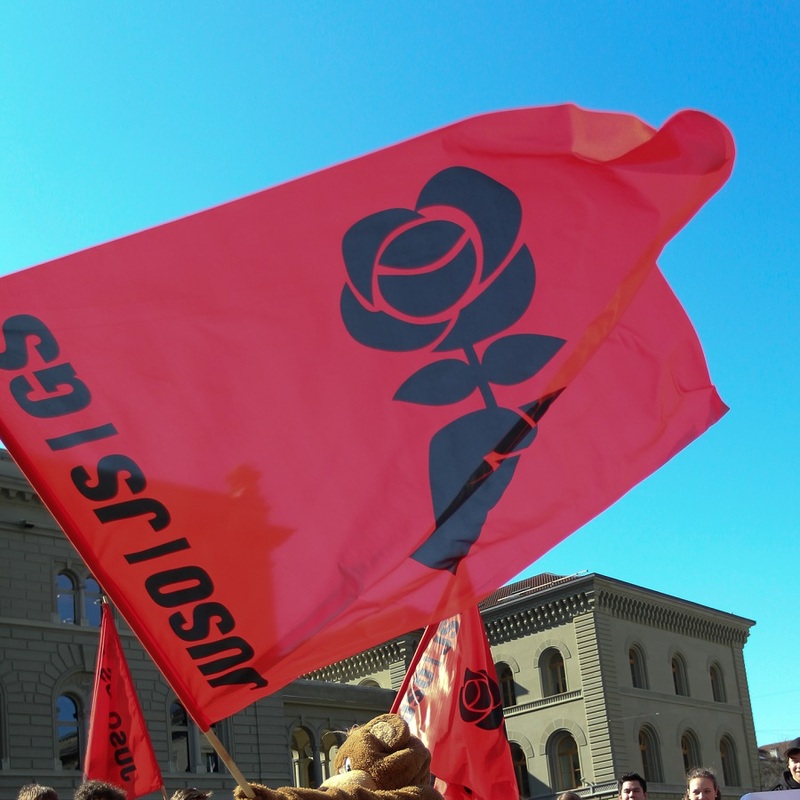 The flag is red and shows the rose-in-the-fist logo plus the short names of the organization in the three languages (in black with a red acute accent each). Based on flag photos, the flag is longer (ratio 3:4) with a rose-in-fist emblem. 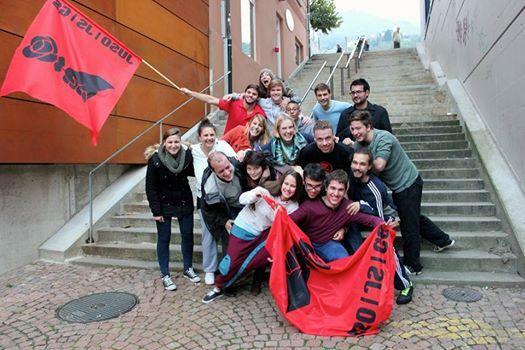 Queer Workgroup (French: Groupe de Travail Queer) is a permanent workgroup of the Young Socialists Switzerland / Swiss Socialist Youth which deals with the LGBTQ issues. Along with the common flag of the organization, it uses a rainbow flag with six colors, purple/violet at the top, charged with black rose-in-the-fist logo over all; the flag ratio is 2:3 or very close and the logo design is the same as in the common flag. 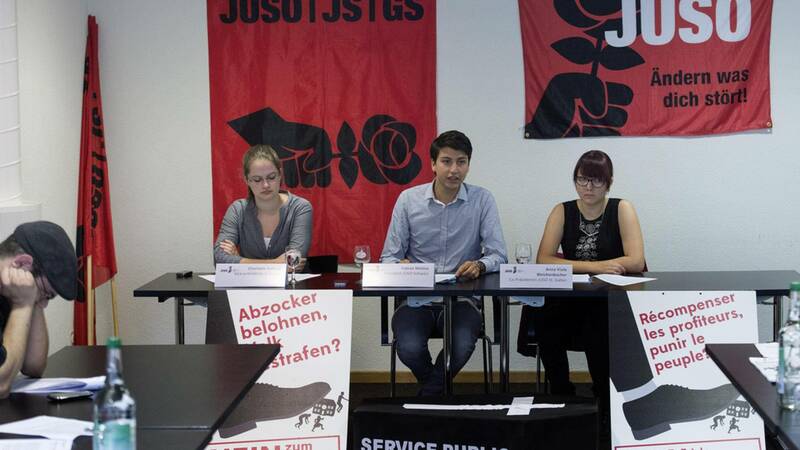 The German name is "Arbeitsgruppe Queer". My calculation regarding the ratio resulted in a slightly longer image with a ratio of 5:8 (1:1.6). 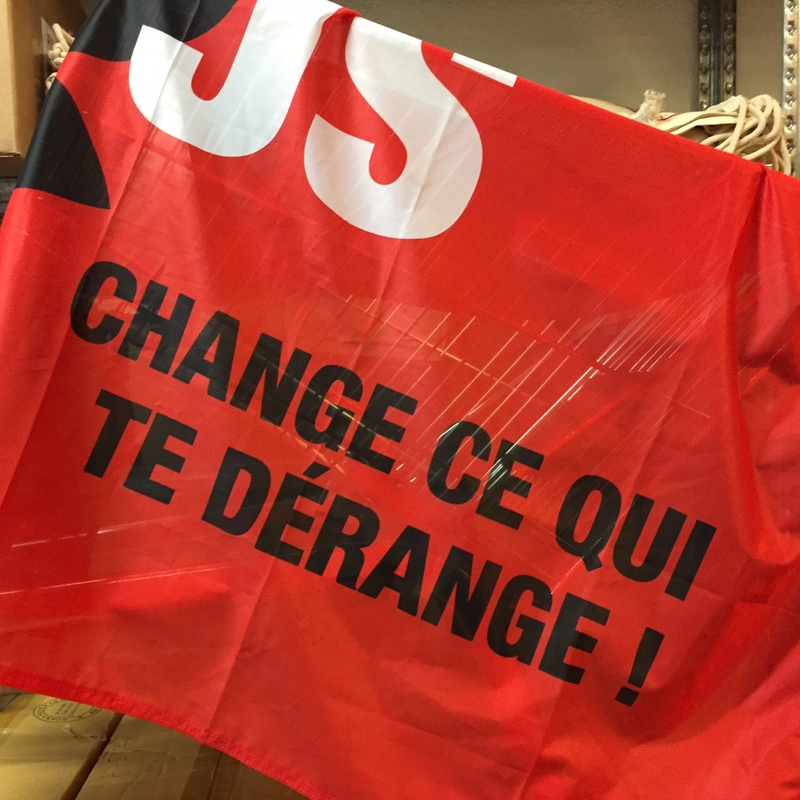 In addition to the already reported flags of the JUSO/JS/GS, there are flags with the slogan for the 2015 elections: "Ändern was dich stört" / "Change ce qui te dérange!" (Change what annoys you!). 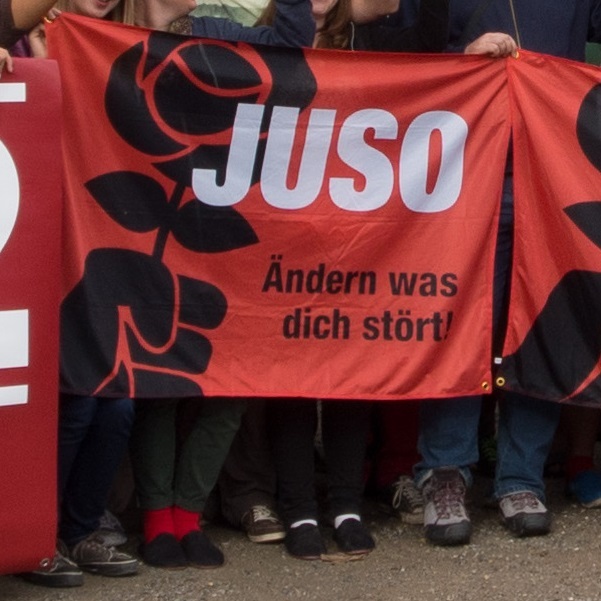 These flags are red with a slightly tilted JUSO rose (couped a little bit) in black, the slogan in black and the organization's abbreviation in white. There is a version in German [1,2,3,4,5,6,7,8,9,10,11] and a version in French [1,12]. I have not found a version in Italian.